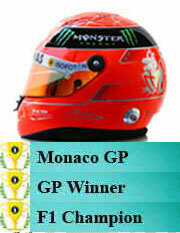 Retired from F1 at the end of 2006 and again 2012 with numerous records. Statistically, overwhelmingly the greatest of all time. A corner at the Nurburgring where named after Michael in 2007. 2008-2009 Michael was in charge of developing cars for Gestione Sportiva - Ferrari's motor racing division. At the Hugarian GP 2009 Felipe Massa got injured and Michael was set to take his place while he was recovering, but Michael had a neck injury after a bike riding accident that stopped him. Late 2009 Michael announced that he would be back in F1 2010, this time with Mercedes. After a skiing accident Michael got injured.